I am trying to locate a digital copy of the framon book if any one knows where I can get a digital copy so i can just have saved to my ipad instead of carrying the book around or having an ongoing subscription to instacoge or genericode when i only use a few codes. PM me if anyone knows of one. Re: Is the Framon Depth and space book available as a pdf? I would also be interested in a digital copy of this. MrPharmer2012 wrote: I am trying to locate a digital copy of the framon book if any one knows where I can get a digital copy so i can just have saved to my ipad instead of carrying the book around or having an ongoing subscription to instacoge or genericode when i only use a few codes. PM me if anyone knows of one. I searched for one for you, didn't have any luck. 2. Hand copy whatever codes you want (those "few" that you mentioned are the only ones you use) and just keep those on hand in your preferred format (digital or hard copy). I rarely have to make keys by code for anything other than Kwikset (5&6), Schlage (5&6), Corbin, or Yale. I made my own custom code reference cards for those, and keep them with my key machine. I also made my own custom pinning kits for Kwikset and Schlage since that's probably 75% of the locks I service, and it's just easier to have separate kits for those. Saves me time from looking at my universal pinning kit to find their section, scanning down for whatever depth, panning over to the decimal pin, and then locating that pin in the universal tray, etc.. Don't get me wrong, I love my universal kit, and wouldn't want to be without it, and I always have a full compliment of pins for Kwikset and Schlage in that kit too... but it's a lot easier having dedicated kits where the pins are in their own little compartments and are labeled simply as "1", "2", etc.. I also have springs, and since Schlage doesn't use a single top pin size for every bottom pin, I keep those as well. They're labeled "T 0-3", "T 4-6" & "T 7-9". Add a few spare bits (clips, pin caps, detent pins and springs for Schlage) and you're set. ... So the whole point of that tangent is that you could do likewise for whatever you work with the most often. I bought a project framon 2 machine i need. Cord belt vice and spacing blocks and some tlc does any one know how much a new top end of vice cost or does someone have dimensions so maybe i could mill one or 3d print one? I have seen the code book on eBay from time to time, usually around $50. Beyond this, I would say contact Framon, tell them that you have purchased a machine second hand, and see what information / prices they quote you for missing parts. I think all the disciples of the Framon cult are all old enough they still don't like to use computers. mdc5150 wrote: I think all the disciples of the Framon cult are all old enough they still don't like to use computers. Hey! I like the blue book! Also, get off of my lawn! If I didn't have the blocks, I might be inclined to just buy them from a distributor. They sent me some kind of code for Genericode or something, but I didn't get any floppy disks so I guess I'm stuck with the book. "Get off my lawn!!" ... I so read that with Steve Buscemi's voice from 'Monster House', lol. Personally, I like working with micrometers rather than code cards. I know the code cards are just the "user interface" so to speak, and are still using micrometers, but... it's not the same!! Seriously, more control reading the micrometer directly. As for Genericode, I would contact them, there should have been an installation CD. I would think genericode is now a download rather than a disc. I've a very old copy of genericode, i always treated it as a poor man's instacode but it's actually very good. Instacode is still my favourite though. Mrpharmer2012: If you tell me what spacing you're looking for, I can examine the blocks I have and tell you which one has your spacing. I only use the block as a guide to get me to the right general spacing, so if you're a bit handy you can make your own block and mark the spacings you need with a sharpie. Since the carriage moves 50 thou each rotation, the sharpie marks will be close enough for you to dial the spacing in. With the Framon machine you're setting the actual cut depth rather than trying to get the needle lined up on a card. Of course, when setting up systems, it's easier to work with integers as depth values, but being able to cut any depth is handy. The upside is that you don't really need the blue book - if you have the HPC D&S table, it contains all the information you need for common jobs, and information for many less common locks. The generic cutter profile will work for many jobs - I bought specific Schlage, Sargent, Cisa and SFIC cutters, but you can probably get away without that - I guess theoretically you'd have potential problems at MACS with the wrong cutter but I think the generic cutter works in most cases. That link to the operations PDF posted earlier contains the relevant operating information for the machine that isn't D&S data, so with that you have all the data you need to cut keys. Oh, I thought it gave the dimensions you were looking for to mill or 3D print your own parts. I must have misunderstood. tpark wrote: Mrpharmer2012: If you tell me what spacing you're looking for, I can examine the blocks I have and tell you which one has your spacing. I only use the block as a guide to get me to the right general spacing, so if you're a bit handy you can make your own block and mark the spacings you need with a sharpie. Since the carriage moves 50 thou each rotation, the sharpie marks will be close enough for you to dial the spacing in. I reached out to Phil at Framon and he was nice enough to provide them to me, so if anyone else needs the info here it is, you would think they would post this on website so you knew which blocks to purchase. 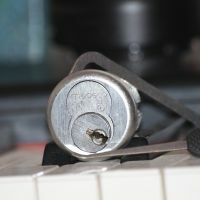 I have only used the framon once over the summer about 5 yrs ago when I made the medeco code setting keys and had the opportunity to pick up this machine for $100 and $20 shipping it is in bad shape but will make a nice project for my side work, I have the Ilco Universal II but having to have the card is a pain at times. I have the few printed from instacode that I use all the time but have always wanted to get the framon back, If I get this one up and going nicely I may offload the Ilco and just use the framon, will get much more accurate keys. Pulled an image and calibrated the size and gonna test a schlage spacing when i get my machine, Should be able to place spring inside and snap the shaft in if measured right may need some filing or sanding , and should work same as original possibly we will see. I have grooves in it so i can apply white paint and wipe off keeping in groove. this is test number 1. Machine wont be here till the 15th.